Here's a pet peeve: Through eight years of the two George W. Bush administrations, I linked hundreds of times to White House and Department of State documents, plus less frequently to other U.S. government departments and agencies. I made efforts to link to original documents (and not news articles, much less blogs) because, having earned a Ph.D. in history, I value primary sources. I assumed during those years that the documents, being part of the U.S. government's permanent record, would remain available so long as the government and the internet were functioning – in other words, a long time. I assumed wrong. 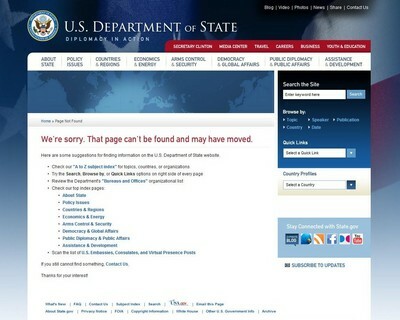 On coming to office, the Obama administration in an instant removed thousands (millions?) of pages, abruptly making dead and useless all those links to the prior administration's work. Latterly I learned that the Bush administration pulled this same trick against its Clinton predecessor. What one finds in the Obama era on looking up G.W. Bush administration links. Aug. 31, 2010 update: David Gerstman points out where State's archives can be found at "Where the Bush administration now resides."